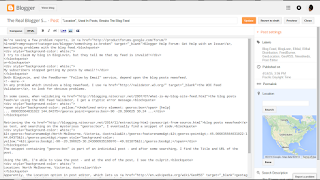 We're seeing a few problem reports, in Blogger Help Forum: Get Help with an Issue, mentioning problems with the blog feed. I try to claim my blog in BlogLovin, but they tell me that my feed is invalid! My subscribers stopped getting my posts by email!! 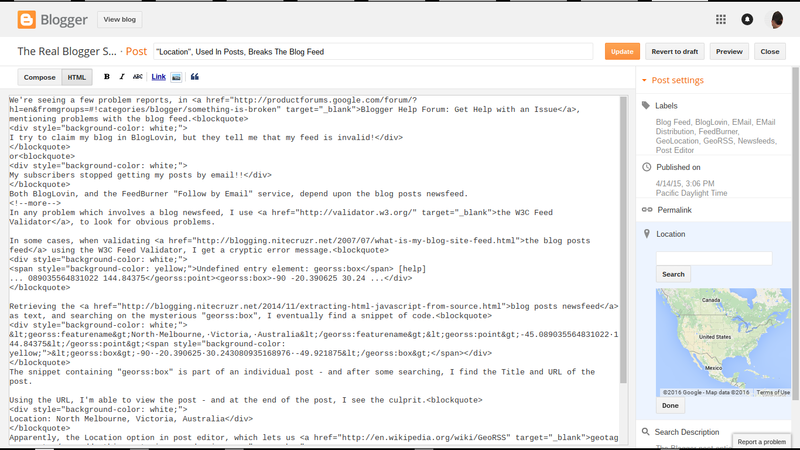 Both BlogLovin, and the FeedBurner "Follow by Email" service, depend upon the blog posts newsfeed. 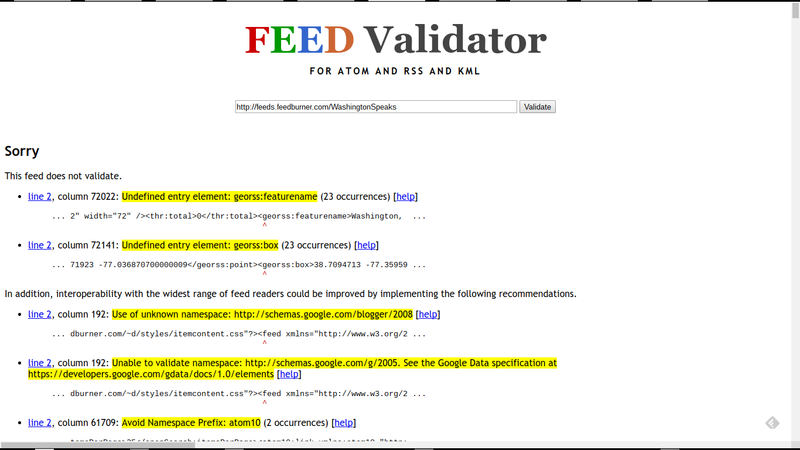 In any problem which involves a blog newsfeed, I use the W3C Feed Validator, to look for obvious problems. 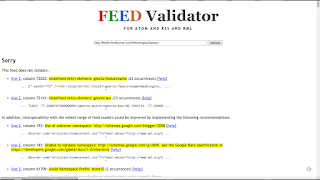 In some cases, when validating the blog posts feed using the W3C Feed Validator, I get a cryptic error message. 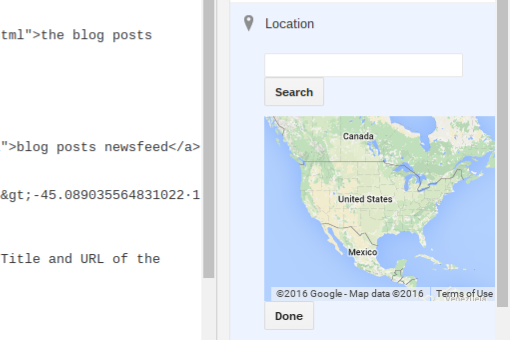 The "Location" feature, in Blogger, lets you geo track your posts. It's easy to add Location detail, to each post. Retrieving the blog posts newsfeed as text, and searching on the mysterious "georss:box", I eventually find a snippet of code. The snippet containing "georss:box" is part of an individual post - and after some searching, I find the Title and URL of the post. Using the URL, I'm able to view the post - and at the end of the post, I see the culprit. Apparently, the Location option in post editor, which lets us geotag our posts, adds this mysterious, and poisonous "georss:box". It looks like the mysterious entry "georss:box" is not accepted by either BlogLovin or FeedBurner. A post containing Location generates a "georss" entry in the feed - and this is a problem. If you want to claim your blog, in BlogLovin - or provide blog updates using FeedBurner "Follow by Email" - you can't publish posts using the Location option. 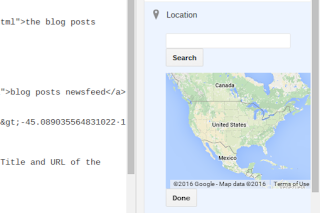 Until Blogger Engineering modifies the Location option, that's the simplest solution.